After remaining depressed for most of the recovery period, inflation has moved back up toward the Federal Reserve’s 2 percent target over the past year. The personal consumption expenditures index—the Fed’s preferred measure of inflation—came in at 2 percent in March and remained slightly above this threshold over the following three months on a year-over-year basis. The core PCE index, which excludes the volatile food and energy categories, briefly touched 2 percent in May before retreating slightly to 1.9 percent in June. A similar trend occurred at the end of 2016, after which inflation fell to as low as 1.3 percent by August 2017. The question now is if this recent uptick in inflation will sustain or even move higher, or if this is another transitory event. Another measure of inflation, the consumer price index, has trended a bit higher, rising to 2.9 percent in July on a year-over-year basis (the latest available data at time of publication). The major driver of the headline index has been the increase in energy prices, which are up 12.1 percent over the last year. The core index rose to 2.4 percent, driven in large part by shelter costs, as the core CPI excluding shelter rose only 1.5 percent over the last year. Outside of shelter costs, there are few areas that are a cause for concern. Wholesale inflation has also increased over the past year, as the producer price index rose to 3.3 percent in July on a year-over-year basis. The core PPI, which excludes food, energy and trade services, was up 2.8 percent. In the first half of this year, the headline index has been pushed up by rising oil prices, while an increase in transportation costs contributed to the rise in the more stable core index. In the first half of the year, uncertainty over trade policies had yet to have a major effect on inflation measures, but broad-based tariffs could eventually put an upward pressure on prices. While these measures of inflation have firmed over the first half of 2018, there is no overwhelming evidence that the trend is bound to continue. The annualized rate of inflation in the PCE, core PCE, CPI and core CPI indexes actually softened in the second quarter compared to the first quarter of the year. On an annualized basis, PCE and core PCE were 2.5 percent and 2.2 percent, respectively, in the first quarter. They decelerated to 1.8 percent and 2 percent, respectively, in the second quarter. CPI and core CPI display an even greater deceleration, as they grew at an annual rate of 3.5 percent and 3 percent, respectively, in the first quarter, but retreated to 1.7 percent and 1.8 percent, respectively, in the second quarter. There is evidence that inflation has picked up in the third quarter in certain sectors of the economy, but it is important to look at the entire picture, and not just headline numbers. 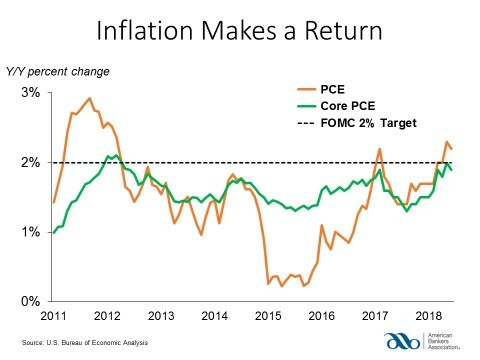 It will be prudent to keep a detailed eye on the inflation reports moving forward, especially with wage growth strengthening and tariffs proposed by the administration beginning to take effect. The Federal Reserve—specifically Chairman Jerome Powell—has signaled a willingness to let inflation run a bit above its symmetrical two percent target as the economy may not be at full employment yet. 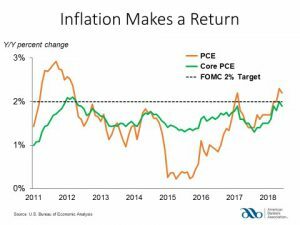 However, if there are clear signs of a substantial increase in inflation, the Fed will act swiftly to bring it back to target.